· The government is aiming to double the income of farmers by 2022. “An amount of Rs 35,984 crore will be alloted for farmers’ welfare doubling their income in the next five years,” said Jaitley. · A dedicated irrigation fund worth Rs 20,000 crore to be set up under NABARD. · Farm, rural sector, infra, social sector to have more government expenditure. · Nominal premium and highest ever compensation in case of crop loss under the PM Fasal Bima Yojana. · “Pradhanmantri Krishi Sinchaai Yojna stregthened and implemented in Mission Mode”, said the minister. · A new health protection scheme for health cover upto Rs 1 lakh per family and senior citizens would be applicable for an additional top-up of Rs 30,000. · Launch of a national dialysis plan under PPP to address growing renal disease cases and 2000 new dialysis centres in the country to be started. · 35,000 medical stores under Pradhan Mantri Jan Aushadhi Yojana to make quality medicine available across the country. · A digital depository will be there for school leaving certificates and a higher education financing agency will be set up with a fund of Rs 1,000 crores. · The government targets to skill one crore youth in the next three years under the PM Kaushal Vikas Yojana. · The National Skill Development Mission has imparted training to 76 lakh youth, along with setting up of 1500 multi-skill training institutes. · Sixty two new Navodaya Vidyalayas to be opened. · An amount of Rs 55,000 crore for roads and highways will be allocated. · Total money allocation to road sector, including Pradhan Mantri Gram Sadak Yojana (PMGSY) is Rs 97,000 crores. · Target of 10,000 kms of national highway and upgradation of 50,000 kms of state highways in 2016/17. · Financial Data Management Centre will be set up for integrated data collection and analysis. · Comprehensive Code to be introduced to provide a specialised resolution mechanism for bankruptcy of banks/insurance companies. · Rs 25,000 crore for recapitalisation of public sector banks. · RBI Act to be amended to give statutory backing for monetary policy. · Target of disbursement under MUDRA increased to 1,80,000 crore. · Amount sanctioned under PM MudraYojana has reached Rs 1 lakh cr to cover 2.5 cr borrowers by Feb 16, informed the minister. 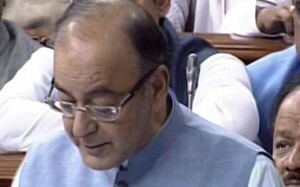 · Service tax on single premium annuity to be reduced to 1.5 per cent from 3.5 per cent. · Clean energy cess increased from Rs 200/ton to Rs 400/ton on coal, lignite and peat. · Penalty to be 50 per cent of tax in income under-reporting cases, 200 per cent in misreporting of facts. · Excise Duty on tobacco products increased by 10-15 per cent. · Income tax department will expand e-sahyog to assist small taxpayers. · 11 new benches of tax tribunals to be established to reduce pendency. · Proposal for government will pay interest rate of nine per cent over six per cent if delay is more than 90 days. · Plan to use technology in Taxation department in a big way. The Minister also highlighted the achievements of the government in the last three years, one of which is rural electrification of 5,542 villages in Feb 2016. He further talked about 100 per cent rural electrification by May 1, 2018.